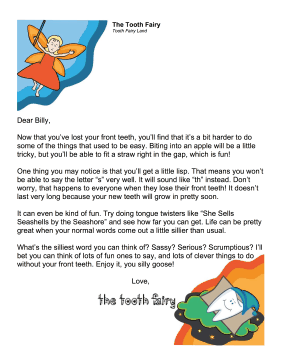 Children who are anxious about lisps caused by lost teeth can be reassured with this printable tooth fairy letter. Now that you've lost your front teeth, you'll find that it's a bit harder to do some of the things that used to be easy. Biting into an apple will be a little tricky, but you'll be able to fit a straw right in the gap, which is fun! One thing you may notice is that you'll get a little lisp. That means you won't be able to say the letter "s" very well. It will sound like "th" instead. Don't worry, that happens to everyone when they lose their front teeth! It doesn't last very long because your new teeth will grow in pretty soon. It can even be kind of fun. Try doing tongue twisters like "She Sells Seashells by the Seashore" and see how far you can get. Life can be pretty great when your normal words come out a little sillier than usual. What's the silliest word you can think of? Sassy? Serious? Scrumptious? I'll bet you can think of lots of fun ones to say, and lots of clever things to do without your front teeth. Enjoy it, you silly goose!